Gebs Lifecycle Reporting Connector provides access to the User Specification Library from the Web Publisher Server directly in Rational Team Concert so that you can load and publish reports while developing your applications. 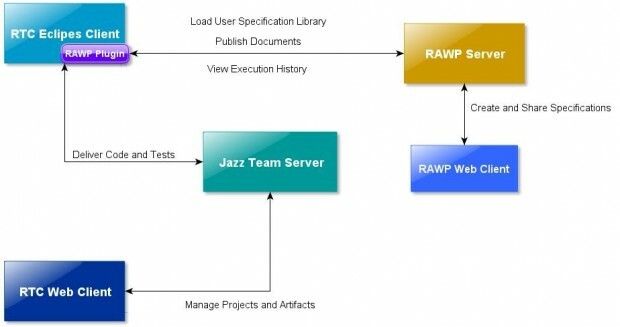 The connection to Jazz Team Server provides information to configure the document specifications together with traceability reporting capabilities over the all CLM (Collaborative Lifecycle Management) resources: work items, test cases and requirements. The plugin we developed needs to connect to: Web Publisher Server and Jazz Team Server. In order for the connection with the Web Publisher Server to be established successfully the end-user has to provide the host name, port, his username and password. We use the valid server connection of the current logged user to query the repository, so in order for our plugin to use the valid server connection the current user must provide his repository username and password. All this information will be provided in the specialized Connection Configuration preference page available in the plugin. Server Renaming is an automated operation. The user does not need to change the URL himself, as our plugin uses the CLM repository URI from the valid connection of the current logged user. The connection to Jazz Team Server provides information to configure the document specifications together with traceability reporting capabilities over the all CLM resources: work items, requirements or test cases. These resources are accessed through specific URIs. The URIs are used in our application to configure the datasources in a template. They are constructed from a baseURL and a Service. The baseURL is taken automatically from the valid connection of the logged user in IBM Rational Team Concert so in case a rename happends, the baseURL will be updated automatically. The Service (for quality management, requirements or change management repositories) need to be provided by the user as a global variable in a preference page provided by our plugin, so the Service information can be modified at any time. Document Specifications might have external variables which can be configured before running. Our plugin provides a preference page where the user can add external variables with a name and value and these will be checked and replaced in the document specification by the wizard when generation the report. These external variables could be general information that a company has to provide often in its reports like company name, logo or contact information that might never change so there is no need to insert it every single time a report is being generated. They can also be repository links to CLM resources.